Tony Spollen’s book is a little gem. It is a life’s accumulated wisdom distilled to fifty essential points. This is a book which should always be within easy reach. 9 – Create a positive atmosphere. 21 – Go for it. 42 – Learn to write a short letter. We spend a lot of time running at 100mph and sometimes you need to regroup and take a look at whats important in life. This book for me spells it out beautifully. Congratulations and best of luck with the publication. This is one of the most important books you will ever read! It is full of simple, yet profound, messages for every person and especially for leaders and managers in the private, public and voluntary sectors. Learning and using the 50 lessons are sure ways to live life to the full in every situation, alone or in interaction with others. Each lesson can be read in about one minute, but the content has taken the author years of experience to distil and displays a style of communications that is a pleasure to read and powerful in impact. This should be a well-thumbed and much consulted reference book and source of encouragement for everyone! The beauty of Tony Spollen’s book is that it is born of a lifetime’s experience. This is no new age lifestyle guru simply dishing up his latest publication. This is a man who has dealt at close quarters with people all his life. He knows what makes us tick and what makes us miss a beat. In the sometimes austere, pressurised desert of the modern world, this little book is an oasis that acts like a best friend. I found the book to be one that I could share with my teenage kids, my wife, my siblings and mother. The key strength of the book is its conciseness. I like its ability to get to the point so efficiently which I have no doubt will appeal to our very busy world. Just finished your book and really enjoyed it. It has a refreshing honesty that gets to the point quickly. It is both the most simple and complex of books. It caused me to reflect as I read. Lessons 3, 21 and 24 had particular resonance to me. 42 professionally is a challenge I often come across! I think however each reader will find their own favourite parts of the book based on their life experience. I like the way the book has Irish notes in it but is ultimately a universal book. It could sell anywhere. We are in a fast-paced world where there is much focus on the transitory and instantaneous. This book doesn’t take long to read but it makes a lasting impression. Congratulations. What a great way to spend 90 minutes of my life! A person giving a copy of this book to another will be sharing a great and long lasting gift, lifting both the depressed and distressed as well as adding perspective to the happy and well-to-do. Every coffee-table, bedside locker and boardroom should have one. Nothing in life is truly complex, and this book confirms that: just as night follows day. Well done Tony … and thanks. PS I’ll try to remember each day to breathe well and create space! 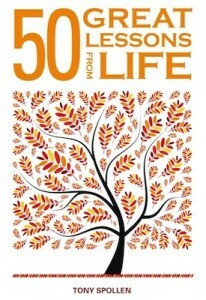 Tony Spollen’s 50 Great Lessons of Life is a wonderful book. I was immediately engrossed in the simplicity and practicalities in each lesson. I just couldn’t put the book down. I wanted to know more and more. Some lessons seemed like common sense, but when l saw it before me in print, the reality dawned on me that anything is possible, and practically any situation can be overcome. I know l have a better outlook on life after reading Tony’s book, and look and deal with situations that arise in my everyday life in a totally different way. Tony’s personal experiences in life shine through in this book, and his honesty is palpable. This is a book that has a little piece of wisdom for everyone, both young and old. But what I like most about 50 GREAT LESSONS FROM LIFE is its authenticity. I’ve only gotten to know Tony over the past 36 months, but as I recall our many conversations, they are smattered with advice and messages that form part of this book. Tony is not only an author who is good with words; he practices what he preaches. Just as a good whiskey, usice beatha, the water of life, needs to be distilled three times, so you have distilled your wisdom in this book to give us the spirit of life. Sláinte agus saol.